Raising the technical skills and professional competence of charitable gift planners. Our 240 Council members are non-profit gift planners, attorneys, consultants, CPAs, financial planners, insurance agents, stock brokers, trust officers and other philanthropy advisors. For a complete list of local and national membership benefits, please visit our Membership Page. 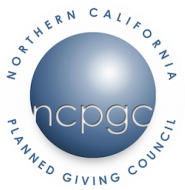 We look forward to having you participate as a member of The Northern California Planned Giving Council.